"Teaching is one of the most rewarding things I have ever done. After 30 years of performing and over 20 years of teaching, I enjoy sharing what I have learned to help others. My approach is simple: it’s all about the student. Each individual is different and I try to cater the lesson according to that person’s individual needs. For example, some people wish to improve their timing or sense of groove; others hope to get better at double bass playing; some are bored with playing the same fills or want to become better at reading music. Whatever the situation may be, I am there to serve the student. Having developed a strong curriculum, I employ an efficient library of resources to also build a strong foundation. I teach a wide range of personalities and levels of playing. My only requirement is that one has to be passionate about the craft. My lessons go beyond just the art of drumming. After a successful career with Breaking Benjamin and continuing work as band leader of Into The Spin, I can offer insight and advice on the music business and all that goes with it." Private Lessons are $35 per half hour or $65 per hour. My home studio is in Selinsgrove, PA, and have students not only locally, but also regulars from Atlantic City, New Jersey, Virginia and New York City. Some students also stop for a lesson while traveling on business. Jeremy also offers private lessons at 4913 Gettysburg Road Mechanicsburg, PA 17055 on Tuesdays and Wednesdays each week. For more information please email: jeremyhummel@hotmail.com. 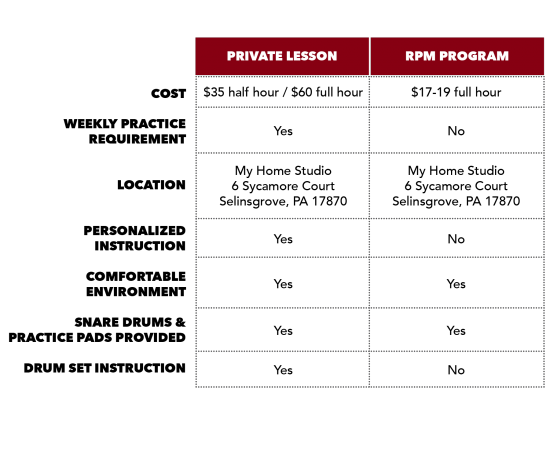 RPM is a great opportunity for students grades 5 through 12 to improve their drumming skills in a fun environment. 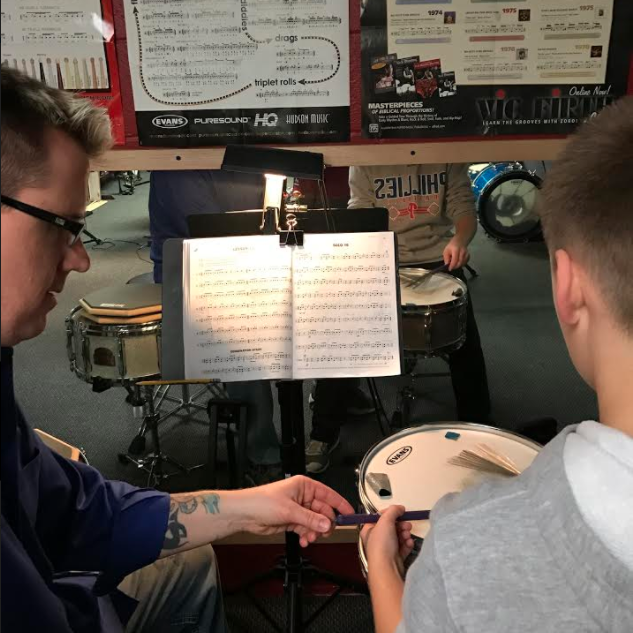 We learn the 40 standard rudiments from the Percussive Arts Society which Vic Firth outlines in a poster that students will receive for free. Students also learn the details of being able to read music with strong level of proficiency. Finally, each student receives a binder to safely organize all music that is worked on. SKYPE or FaceTime lessons are a great way to study with Jeremy if you cannot get to one of his teaching studios. SKYPE and FaceTime lessons are currently the same price as a private lesson ($35 half hour, $65 full hour). Payment is made simple through PayPal and should be done prior to the start of the lesson. To connect with Jeremy via SKYPE, use JeremyHummel.com. To pay via PayPal, use the address jeremyhummel@hotmail.com. Jeremy is also a regular attendee of major events such as Modern Drummer festivals and PASIC, in addition to Hudson TIP and Vic Firth PDT seminars to keep up to date in the latest technology, media, and other ideas. & Right Foot – 4:10 min. Exercise #1a: HH Option – 1:15 min. Exercise #2: – 6:57 min. Exercise #3: – 5:54 min. Exercise #4: – 4:11 min. Exercise #5: – 4:44 min. "Natural Life" – 6:25 min.